During the Wales summit in 2014, the need for modern, robust and capable forces at high readiness, in the air, on land, and at sea, in order to meet current and future challenges was highlighted. It was stated NATO joint air power capabilities require longer-term consideration and an analyses of the future role of joint air power should be conducted. Following this political guidance, which has implications for the Alliance’s Long-term Military Transformation (LTMT) process, the Bi-SC issued the ‘Report on Joint Air Power Capabilities’ in late 2015.1 This document sought to provide a strategic vision for the future role of joint air power as well as identifying its capability requirements for the future security environment out to 2030 and beyond. These requirements now have to be considered in different sub-areas, such as rotary wing operations. Vertical lift was amongst the most critical capabilities required in recent NATO-led operations, since it is usually needed quickly and in relatively large quantities. However, a shortage of rotary wing assets hindered ISAF operations when NATO initially assumed command and it took a long time to make them available in sufficient numbers and quality.2 Explanations for the delay included a lack of helicopter capacity within the Nations aggravated by delays in new deliveries from industry. Such unacceptable conditions should be avoided in the future. Today, NATO Nations operate nearly 10,000 rotary wing assets of various types from around a dozen manufacturers.4 In many countries, replacement or modernization programs are ongoing or planned in the short- and medium-term; however, little has been done to harmonize this effort amongst the Allies as well as their industry partners. Yet, the improvement of NATO’s future rotary-wing capabilities cannot be based solely on the acquisition or upgrade of single helicopter models. In the light of recent operational experience, the rapid evolution of technology, and the anticipated threat environment, NATO must formulate a concept for the future employment of rotary-wing assets. This concept should provide a coherent and comprehensive strategy for a widely harmonized helicopter development programme. To this end, broader investigation and analyses are needed to determine the necessary capabilities that best serve the Alliance’s future requirements. Since their creation, helicopters have proven to be indispensable on the battlefield and there is a high probability that they will, in some form, be there in the future. The real question is in which form and what kind of tactics, techniques, and procedures (TTPs) will they use? Will they be manned, remotely controlled, or autonomous carriers of personnel, cargo, or weapons? Will there be relatively few robust, durable rotary wing aircraft or a large number of ‘disposable’ assets? Many similar questions may arise when considering future scenarios and operations. In the context of world-wide, out-of-area missions, the geographical and environmental conditions (including threat) for helicopter operations will potentially differ significantly from case to case. A wide variety of assets designed for different purposes will be needed. Through at least 2030, it is foreseen that a combination of highly advanced new generation aircraft will operate in parallel with ‘legacy’ equipment. While many smaller nations will likely fit older helicopter types with advanced flight assistance and weapon systems, it seems obvious that larger and wealthier nations will upgrade to the newest, most advanced technology. In the meantime, the amount and ratio of rotary-wing remotely piloted aircraft systems (RPAS) will probably increase. Their ground stations may be able to control operations using real-time virtual modelling of the geographical mission area, while highly sophisticated computer and communication systems will allow them to quickly adapt to changing tactical situations. Such rotary-wing RPAS might also work as decoys in concert with manned, fast platforms such as Vertical Take-off and Landing (VTOL) assets. On the other hand, fast VTOL aircraft may not serve very well in a contested urban environment, where a low signature, high agility, and advanced obstacle avoidance have priority over relatively high speed and range. One could envision a mass of relatively small, remotely piloted or autonomous rotary-wing carriers of high-end weapon or ISR systems, or even personnel, as enablers for operations where speed and surprise coupled with low signature and masked movement are required. It is almost impossible to formulate an all-inclusive list of threats Alliance rotary wing assets might face on a complex future battlefield. In addition, advanced technology will arise with its own specific vulnerabilities an opponent may seek to exploit, for example total reliance on space assets, radio frequencies or single power sources, as it is indicated in the aforementioned Bi-SC Report on Joint Air Power Capabilities’. This is especially true if we consider near-peer competitors, who have or are acquiring capabilities that could hamper our operations or even prevent aircraft launch and recovery. However, history has shown even smaller adversaries learn to adapt, sometimes acquiring limited numbers of advanced systems or applying asymmetric tactics that mitigate Alliance advantages. In addition, high-tech systems might have low-tech vulnerabilities. We are unfortunately too familiar with the use of small arms fire or rocket propelled grenades against high-tech helicopters as an example of a low-tech threat impeding mission success. A more modern threat is the use of technologically advanced commercial-off-the-shelf products such as small drones fitted with ordnance or small jammers with relatively high power. In addition, advanced air defence weapons or lighter versions of directed energy weapons might end up in the hands of irregular opponents through proliferation. In any case, the availability of highly sophisticated self defence systems, both active and passive, is an important factor in maximizing survivability of future systems. Since the old adage, ‘the higher your wall is, the longer your enemy’s ladder will be’ seems to endure throughout history, speed and resolve in decision making about the future helicopter capability will be paramount for success. Having said this, the intended planning horizon of the current initiative should be critically examined. In NATO terms, ‘long-term’ is usually understood as 15 years and beyond into the future. This definition aligns long-term with the 2030 timeframe, when much of the current military helicopter fleet will reach the ‘cliff edge’ of its expected service life. However, if the turn-around time from project initiation to delivery of new systems is taken into account, it is wiser to look further than 15 years ahead. New technology typically spends more than a decade in development. The famous example of this is the US tilt-rotor system, the V-22 Osprey. It was first initiated in 1982 and the prototype was delivered nine years later. It took another 16 years to reach initial operational capability with the US Marine Corps. The origins of the NH90, the pioneer of helicopters using fly-by-wire system and other state-of-the-art developments, date back to the beginning of the 1980s. The first deliveries started in 2006, despite the formal program contract being signed in 1992. Considering helicopters today were designed 30, 40 or even more years ago, armed forces today tend to procure equipment for the next three or four decades. This means a 15-year planning period may be too short, especially when it comes to new system development. On the other hand, interim solutions that can be applied on already existing assets may require a shorter timeframe. Different aspects of helicopter capability development are currently being discussed across a wide community of interest. At the forefront of concept development, standardisation, and program management, there are a handful of NATO organisations, such as the Science and Technology Organisation, Applied Vehicle Technology Panel, the NATO Army Armaments Group – Joint Capability Group Vertical Lift, the NATO Standardization Office’s helicopter-related working groups and panels. And (last but not least) the NATO Helicopter Design and Development Production and Logistics Management Agency, whose mission is the management of the NH90 program. These organisations, along with numerous other NATO and non-NATO organisations, partner nations, academia, and industry are repositories of knowledge and progress in the Alliance’s rotary wing capabilities. As personnel move into and out of these entities, the level of corporate knowledge will change (typically decreasing), rendering this a time-sensitive issue in more than one way. Given a highly uncertain future, a long-term rotorcraft capability development concept must be formulated using the broadest theoretical knowledge base available to the Alliance. The ideas presented by academia, industry, and military experts, including operators, must be fused so the risks of long term thinking can be minimized and the best synergy between operational requirements and technological advances can be created. Allied nations, NATO organisations, agencies, program offices, and centres of excellence, along with operational and tactical commands, have to participate. Any design of future helicopters needs to be based on a larger strategic concept considering assessed future requirements. In other words, technology pull by the warfighter has to be dominant over technology push from industry. Optimal solutions have to be developed in order to avoid under- or oversizing capabilities while maintaining cost effectiveness and minimizing logistic footprint. This includes the use and modernisation of legacy equipment delicately balanced with the utilisation of new equipment. The maximum freedom of thinking and creativity is required to develop scenarios in which helicopters may operate in the future, since NATO’s future helicopter capabilities will depend on thorough analysis and planning today. The Joint Air Power Competence Centre is strongly committed to foster the development of an overarching future rotorcraft concept and pursue translation from strategic analysis and technological developments into operational concepts and capability requirements for the 2035 and beyond. 1. BI-SC Final Report On Joint Air Power Capabilities; SACEUR, SACT, 07 December 2015. 2. Aviation Week Report: NATO Accelerates Search For More Helicopters For Afghanistan Operations (Accessed: http://tonyprudori.pbworks.com/f/NATOPush4Choppers-AvWeek-25Nov07.pdf; 4 May 2016). 3. Pat Collins, UK Ministry of Defense, United Kingdom; NATO AVT 36th Panel Business Week Prague, Czech Republic, 12–15 Oct. 2015. AVT 245 (Future Rotorcraft Requirement) Specialist Meeting. 4. Figures according to IHS Jane’s, RW assets estimated in service. These include numbers – both operational and training assets – from army, navy, air force, marines and special forces. 5. Quote from Jim Dator: http://www.futures.hawaii.edu/publications/futures-studies/WhatFSis1995.pdf. [accessed: 14 April 2016]. is a 1989 graduate of the Hungarian Defence Forces (HDF) College of Military Aviation. He also holds a Master’s Degree from Hungary’s National Defence University in Budapest and is a graduate of the US ARMY Aviation Officers Advanced Course, Fort Rucker Alabama. He held different positions at his units as a Mi-8/17 helicopter pilot just as instructor and test pilot, unit flight safety officer, deputy-squadron commander and squadron commander of a transport helicopter squadron, commander of a transport helicopter battalion which, among other regular duties, was in charge of the aerial SAR coverage of Hungary. LTC Szabó filled a staff position at HDF General Staff Operations Division as senior helicopter SME, where among his responsibilities were to develop operational requirements for future helicopter procurement and strategic concepts for the training of future military aviators. His operational experience includes several disaster relief operations at his homeland and Mi-17 Air Advisor tour in ISAF. 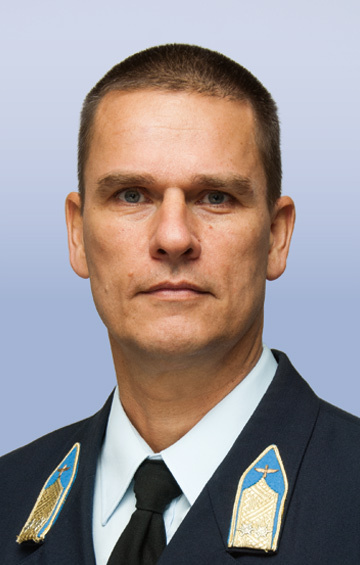 LTC Szabó is currently the Helicopter SME of the Combat Air Branch at the Joint Air Power Competence Centre in Kalkar, Germany.